We all love camping, but most of us hate it in the rain. There is nothing worse than planning the ideal camping trip with limited time in a location, and then the rain comes along to spoil it. 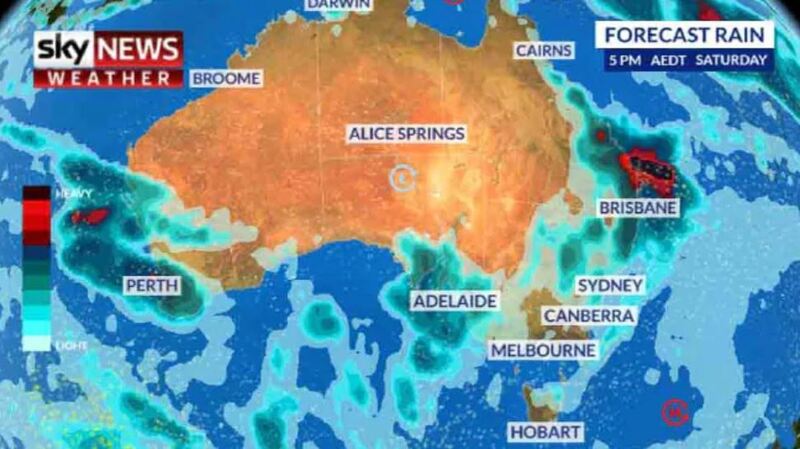 In Australia, right now, summertime, it is the perfect time to camp, but can also be the most likely time you will get lots of storms and rain. Unfortunately, it is a fact of life, and one that sometimes cannot be avoided, and with one of the worst droughts in history affecting many of our farming communities’ rain is something that is desperately needed. Thankfully however you can still enjoy camping in the rain, it just takes a little more preparation. In our time on the road over the last six years, we have learned some things the hard way and picked up some great advice from other traveller’s along the way. We thought we would share some tips with you here, but please feel free to share your own tips, advice or experiences at the end of the blog. It goes without saying, but sometimes, it cannot be avoided. You may only have limited time off and this is the only weekend you can go camping. You may be a camping addict and have to go, rain hail or shine. 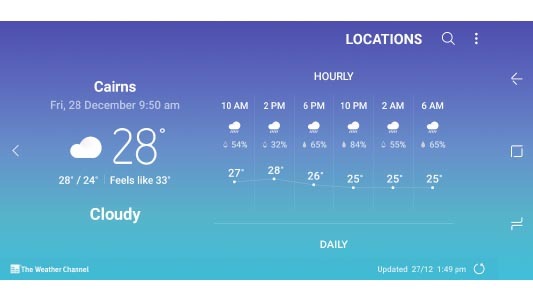 If this is the case, be sure to still check the weather, just to see if it is just a few light showers expected over the coming days, or if it is a major rain depression. This may help you reconsider. After being caught in the aftermath of Cyclone Debbie in 2017 which lead to a major rain depression, we would highly recommend either postponing the trip, or moving to the highest ground possible, and then some! We were relocated to higher ground but flood waters reached un-presented highs and we were still affected. If you know there is rain coming, take more time to select the right site. It might look great down by the water’s edge, but rivers may rise. Sites on lower ground or with dips in them can collect lots of rainwater so look for raised ground. Flat sites are perfect for sleeping and levelling the caravan, however, if you know rain is on the way, it may be worth putting up with a bit of a slope, knowing water will drain away a bit faster. Also, try to avoid boggy sites, check the ground for hardness before setting up. Some sites can look firm till they are wet, but then become very boggy, especially when trying to get a heavy caravan over them. If already wet, or it has been raining beforehand, try walking the site first, or driving over it in just the 4WD. If you can’t find an elevated site, try elevating part of the site yourself. There are many camping mats available that can raise you out of the water a few inches. We have our own improvised drainage cells that make ideal camping mats and rise you out of the water. They are ideal placed at the entrance to caravans or tents. 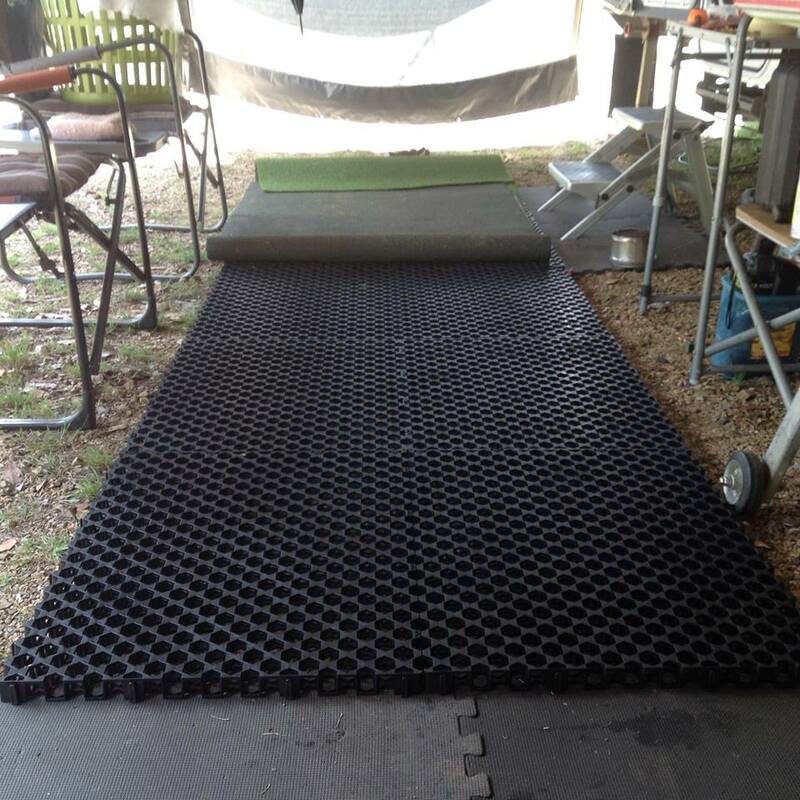 David is one of our members and shown us how he has used the drainage cells to make a large platform under his awning, then used some artificial grass over the top of them to keep things high and dry in the wet. 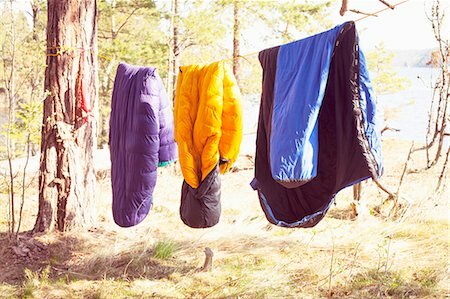 You can find out more about our Camping Mats here. Setting up under a tree, especially in tents can be great for shade on hot days, however, trees can pose a couple of issues. In severe storms, branches may fall or be blown down. Many species of gum trees in Australia are notorious for dropping branches at the best of times, let alone when it is raining or storming. If that is not the case, you may still get lots of rain drops falling from the leaves well after the rain has stopped. 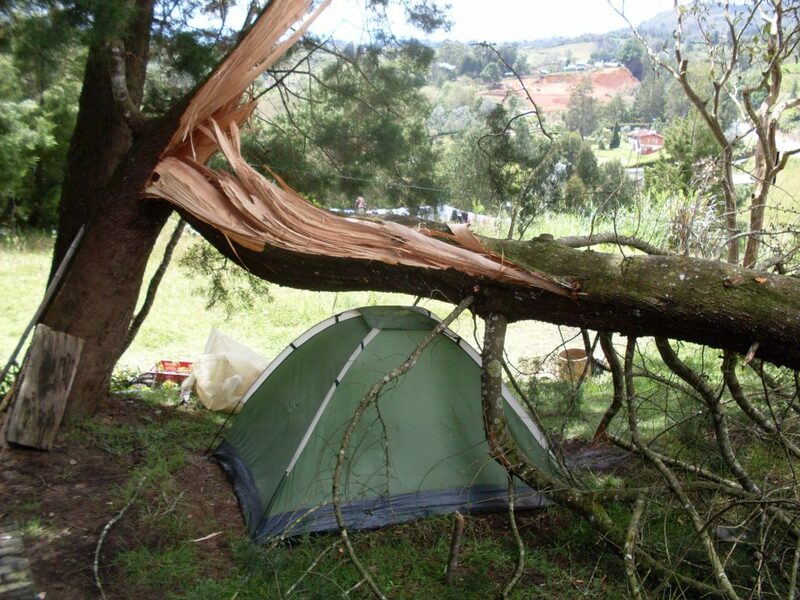 You can see from the image below where this tent based camper had a lucky escape. More campers these days rely on Solar to power up the campsite, which means the more sunlight the better. 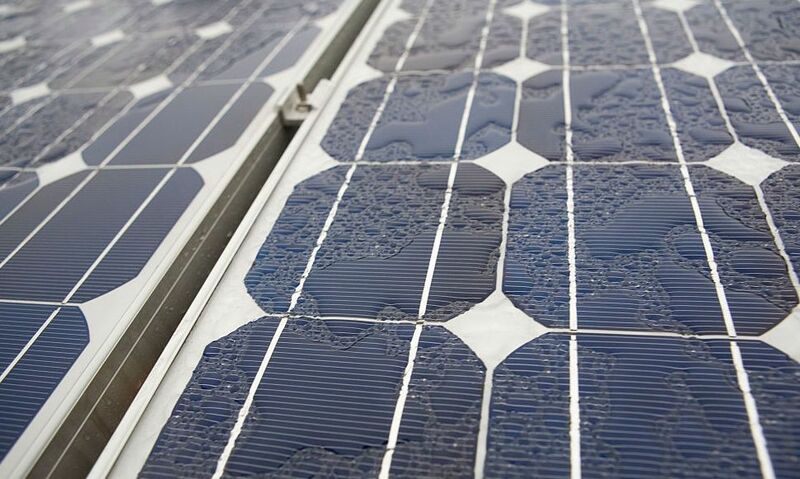 Whilst most modern panels can still produce some charge during short periods of rain, prolonged periods of rain can affect their ability to quickly charge batteries. If your solar system cannot sustain up to 3 or 4 days of rain, it is best to have a backup plan. Either a generator, a small one is only needed if it is just to recharge batteries, or make sure you have plenty of portable back up batteries on hand. To help out in this department, don’t forget our business Partners Battery World are offering 10% discounts storewide to all FRC Premium Club Members. Another safety aspect to bear in mind is that rain water and 240 volts do not mix. 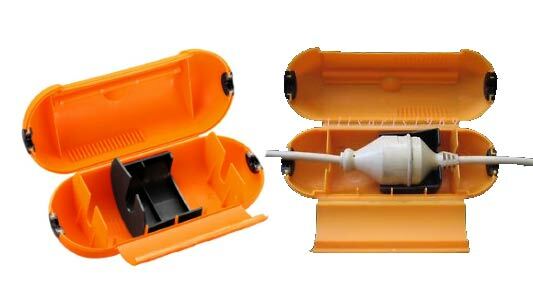 If you are on a powered site during the rain, please ensure that you have adequate protection in the way of a waterproof extension lead joiner. These units come in various shapes and sizes, and available from most camping outlets. They are designed to keep lead joins waterproof in all types of weather. We picked this tip up from a few backpackers we met while travelling in their tents. They were sick of getting their whole bag as well as its contents soaking wet when it rained heavy. They went to the local supermarket and picked up some extra large plastic clip seal bags to put their clothes in. They assured us it worked well and kept things nice and dry in the wet. Don’t let the raindrops go to waste, especially if you are free camping or in an area with limited water. 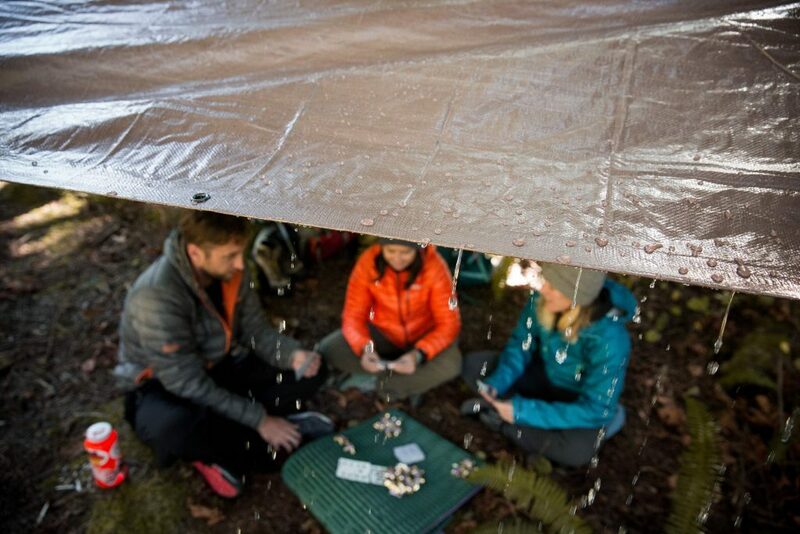 There are lots of ways to collect rainwater that runs off tents and awnings. Fill the bucket and top up the water tanks. If you are in a caravan or motorhome with an awning, check out the Rain Saver Gutter. They transform your awning flap into a gutter and you can then either divert it to your freshwater tanks for more water or divert it to one end, avoiding the water pudding at the bottom of the awning. For more info on the Rain Saver Gutter, you can check them out in the Free Range Campin Shop here. Ideally if you have purchased the right tent, it will have already been waterproofed, however, this is not always the case, especially with some of the older or cheaper tents. If your tent has not been waterproofed, it may be worth buying a good aftermarket, waterproofing treatment. Various waterproofing sprays can be purchased from camping stores and are easily applied. 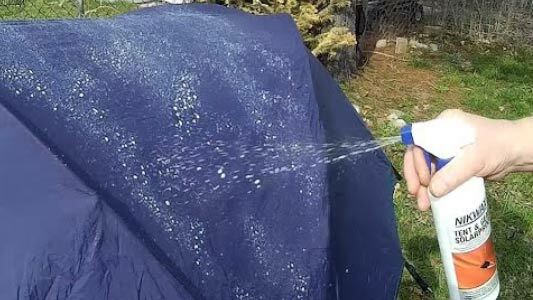 If you are doing this, ensure that you also treat all the seams of the tent as well. You can also use the waterproofing spray on your shoes to keep them dryer. Another consideration instead of waterproofing would be to drape extra tarps over your tent to create a double skin effect, however, this means more to carry. Or you could consider a tent with a small vestibule at the front, giving extra room as storage for wet items. If you are considering a new tent that is both pre-treated and waterproofed with plenty of room including a vestibule, have a look at our Ozil Tra9 Dome Tent we are currently offering as our Group Buy. No matter how much of a pain it is, as soon as you get the chance, dry out any wet items. This might mean doing it as soon as you get home, or on the very next sunny day, but if you don’t do this, it will stink. Guaranteed. It can even go mouldy and make your next trip even more unbearable. We recently camped with a friend who had not unraveled his wet awning for 3 weeks after he had to put it away damp after the rain. The result was a very black awning instead of bright white when he had packed it away. Always look on the bright side, yes it is raining out, but there is still plenty you can do. You are out camping which means you were planning on taking time out anyway. Use the time to perhaps read. Pack plenty of board games, or try talking. Yes, it may be considered a very bizarre activity in our modern world of technology, but just sitting and shooting the breeze can be a great way to use your time while waiting for the rain to pass.